I am pleased to be doing a guest post here for a few times over the next couple of weeks as Aimee takes some much needed vacation time! I am Katie from Belles Lettres Designs. I specialize in wedding calligraphy and I am based in Los Angeles, CA. You can visit my website here and my blog here... or you can stop by my Etsy shop. Calligraphy has an interesting place in today's culture and events. In history it was sometimes the only means of writing and was done with a quill or other type of pen and took various forms. Today calligraphy is somewhat of an unknown thing as we have many other wonderful means of writing and communicating... sometimes we need to add the beauty of detail, flourishes and uniqueness to our events however. This is when calligraphy is most useful. 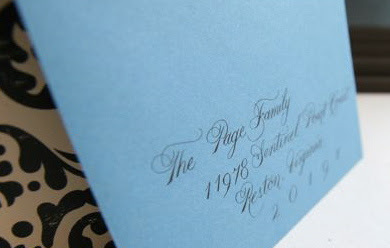 The main use of calligraphy in my business is for wedding invitations. Mostly for envelope addressing, invitation design and return addresses. It is always the best start to your wedding to have a hand-written invitation that had time, effort, and beauty poured into it. The thing I most like is that you can really accomplish whatever style you want to in calligraphy. You are not bound to a font that someone else created. It has been essential for me as I have learned from some of the nation's top calligraphers to first learn the basic hands (styles, fonts). However, this is just the foundation as a springboard to more creativity. I am so grateful to be doing something that I enjoy and get to work with wonderful brides that are in one of the best seasons of life!